I have ACB,Hexo,Cvsi,Trtc and Kushco. it may work out. people do make millions and house payments at penny stocks. however you judt have to remember it's not on solid business ideas but off the money of the sucker's that keep holding bags of stocks after a dump. you maybe early enough here though to make out like a bandit or so late that you're going to 0. hard to tell. As a follow up to my post - I think the difficulty in cloning well at volume is both a good thing for lvvv as far as marketability and their niche. However it could also be a bad thing if they are not going it correctly abd depending on their plan to meet the volume it requires. LVVV has no experience, no capital, and limited at best employees. The premise pushed in this thread of thousands of clones being moved out was implicitly based on the fact that it could be done rather easily - hence you can hire a horticulturist that ran basically a now defunct clone company before - snap your fingers - and with no cash be throwing off thousands of clones just like that. The rest of the weed world just couldn't see how easy it was and thus while they focused on developing 100,000 Sq foot plus cultivation farms, they couldn't see the easy money was buying some pods and just pushing out massive numbers of clones. The contrarians in this thread have consistently asked - what is the secret sauce? - what makes LVVV special in that they can go from literally nothing to the point where a $30 million market cap is a gross understatement (per the longs here). Why if you can set up a clone shop worth hundreds of millions with basically no meaningful capital and no experience did no one else do it. Well the rest of the world is just not as smart as them. There is this inherent belief in a penny stock failure (Hodson) who has bounced from business idea to business idea with no public market success. I maintain the play for the longs is still coming as they will report revenue (not much when they file their now late - shocker - annual report as that only will cover 12/31/19 but when they file Q1). The uplist failure (been over a year since they first announced their plan to uplist (4/5/18)) is unlikely until they catch up their filings (never mind fix their old filings). Again, evidence how bad management is. But that could also be a catalyst if it happens. But the long term argument of millions of revenue a month.... just not in the cards. The cost per clone is relatively inexpensive once you have a trained crew. 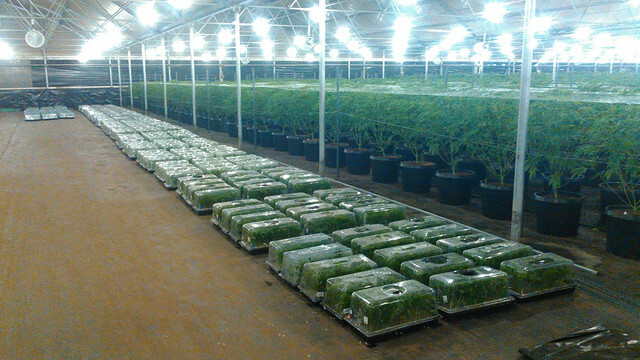 These clones were taken over 2 days using 4 people taking the cuts and 4 people prepping and installing in the trays at $12 per hour. Each tray holds 96 cuts. With the profit margins on finished flower dropping to all time lows in California, on the legal side, I can't see it being feasible to buy clones in the long run. Granted, there will be start up facilities that will have no choice in the beginning. Those will eventually end up mothering out the strains they like and cloning for themselves. I'm trying to get out of the California cultivation phase and building a new CBD extraction facility in Sparks Nevada. Nothing new to report that hasn’t already been reported via LVVV’s twitter/news releases. Tripled capacity at Coachella and the distribution business continues to grow. Financial filings continue to be late as usual . I bought a new Vette this week with the profits I’m gonna make this summer from LVVV. Driving 500 miles next week to pick it up. Bought it online because the Will Cover method is a waste of time. When LVVV hits, I’m gonna do donuts on igoringa’s lawn. When LVVV hits, I’m gonna do donuts on igoringa’s lawn. Probably not good to have a typo on the opening page. LVVV has released their annual report. Seems like their auditor has run from the hills as it is unaudited and their disclosed audit fees for the year to date is zero. Although it could be that they just cant fill out a simple form correctly and the auditors are still around. Each of us can conclude on which incompetence rules. 1) We all knew Q4 was not going to have anything of note to report - it is Q1 2019 that the longs are waiting for. 2) The document is horrific in terms of compliance, typos, missing disclosures … about as bad as it gets. It cuts and pastes from other companies from other years. Their funding came from massive dilution of common stock of 60% over the year and a $ 1 million loan from somebody. With who and at what terms? Now why would they disclose that. LOL. They have a $2.7 million hit for a legal settlement - the nature of which is well a secret apparently (and no it is not the note in dispute). Which leads to the obvious - the ridiculously low bar that it takes to get uplifted.... these guys cant get close. They now have multiple years of financials to gut and redo and still need an audit committee (for starters). Hey atleast that is only off by one year - their material weakness conclusion in the back talks about how they are going to shape up in 2015 lol. Do you like the related parties footnote? Very succinct. It cuts and pastes from other companies from other years. ...so in other words, business as usual? Yes, I have to cede that point! Have not read this entire thread, but does anyone invest in Cresco? They have quite a bit of interest in the Illinois Medical MJ program. They also have interest in out west. Right now Illinois is getting ready to go recreational and lobbyists are trying to restrict competition for 1 year and allow all sales from the existing companies. Cresco just recently acquired a few more of the dispensaries from original owners. The other big players in this state are doing the same. Will be going back to pg 1 and reading what you all have contributed. Something to look into with this happening.